← Hi Ho Hi Ho- It’s off to work we go! 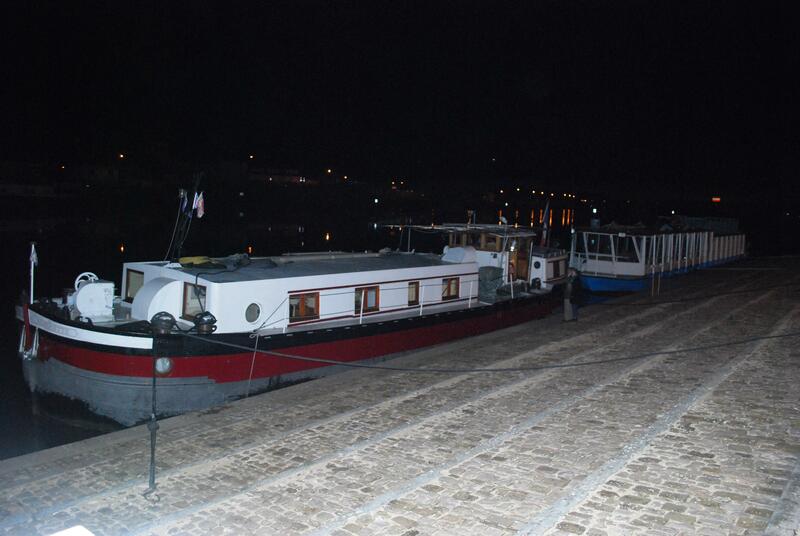 Now that have been moored in Chalon for four month, I miss travelling on the water so when I heard that Rodger had to take his barge, Silhouette to St Jean I asked him if I could come along. I don’t think he had the heart to refuse when I explained that I was going a bit stir crazy not moving on the water. As a boat person himself he understood what I meant, I could see it in his eyes. So Roger, Elham and I set off at sunrise on Sunday on Silhouette an 84 year old live aboard barge. It’s a completely different boat to our own Smelne 12.4 meter long cruiser weighing 14 tonnes, as Silhouette is 20 meter long, 6 meter wide and weighs 100 tonnes. 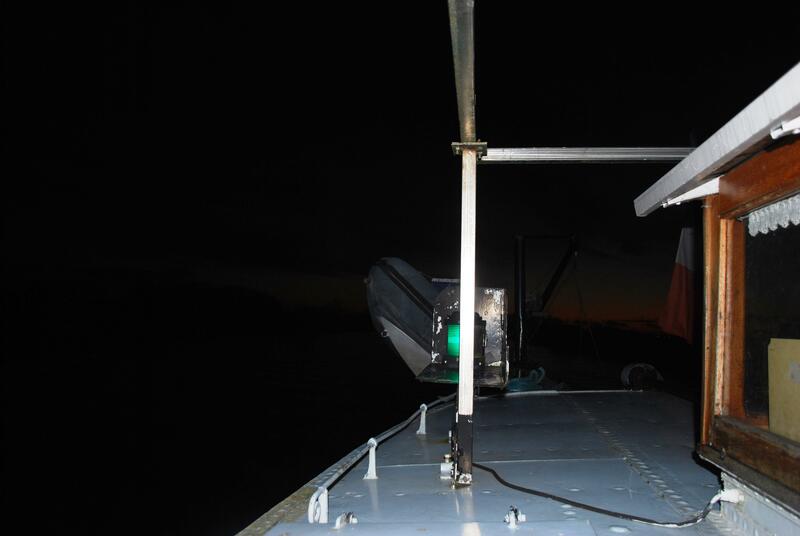 You need to move it slowly and carefully in confined marina spaces as one wrong move could crush a lot of other boats. 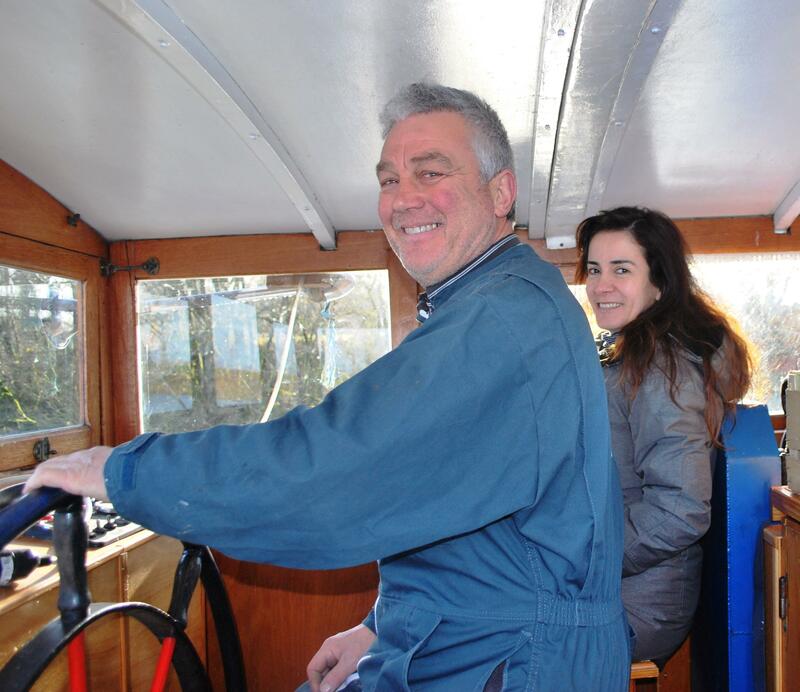 So it was a real thrill for me to get a chance to steer it. Silhouette has a great history ( including Nuala and I having our first French New Year on board her) As I explained in earlier blogs she was originally a Caltex Oil tanker built in 1931. In the 1970’s a section was cut out of her to lengthen another oil tanker so she was reduced to 20 meters and made into a live aboard barge. Roger bought her 15 years ago and has lived aboard since. To get ready to depart the first thing that Roger had to do was start the engine. That’s not as simple as it sounds! First he had to hand pump fuel into the day tank, top up the engine oil, (all old engines are designed to burn oil), open special fittings on the side of the engine cylinders and put in gun powder in cotton wool (yes Gun Powder) and then he had to hand pump diesel into each cylinder. Then he could start the engine, which as it cranks up slowly, the gun power explodes inside which helps the engine to start. There is nothing wrong with the engine- it is perfect. It’s the way engines of its generation were designed to work. I had never seen anything like it before. The trip to St Jean was uneventful. The weather is remarkably good at the moment (8 degrees on Sunday) so the trip was very pleasant. We met three commercial barges en route and it’s great to see this traffic which is the life blood of any waterway. 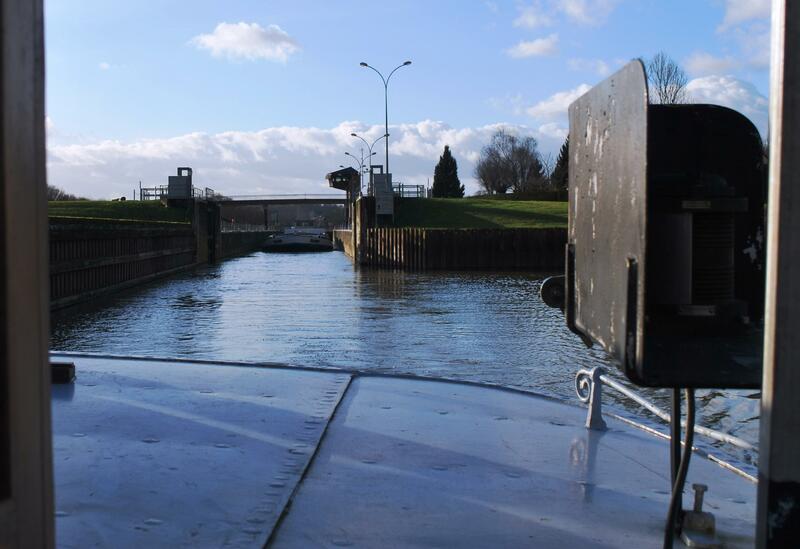 As the current was against us and we had to go through two locks it took 10 hours to complete the trip. 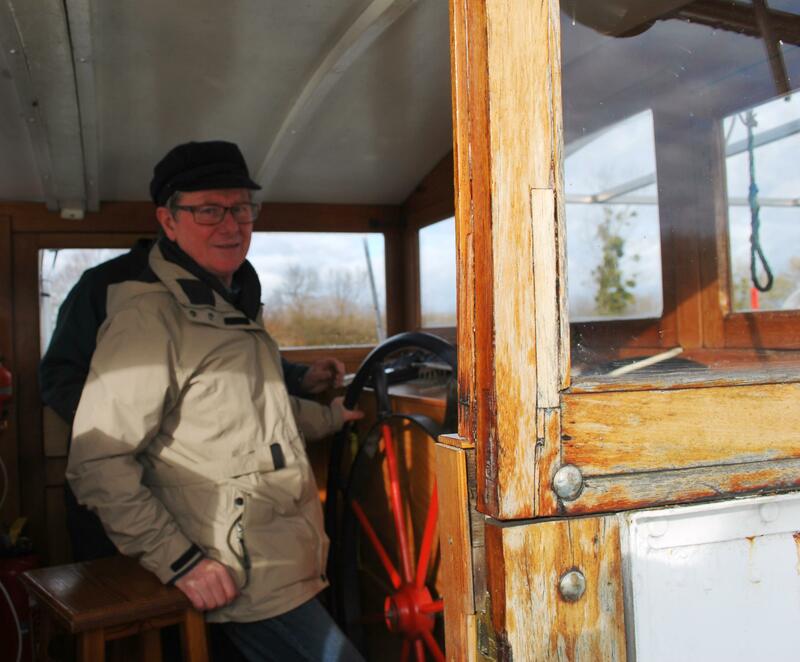 The last two in darkness, but Roger is an experienced Captain who has worked on the Saone for twenty years (He currently owns and operates the Le Delta – a day cruiser from Chalon sur Saone, more information at www.croisieres-saonoises.fr ) this was not a problem to him. We moored up safely on the main quay at St Jean at 7.30pm. So I got to add another new experience to my Gap Year. 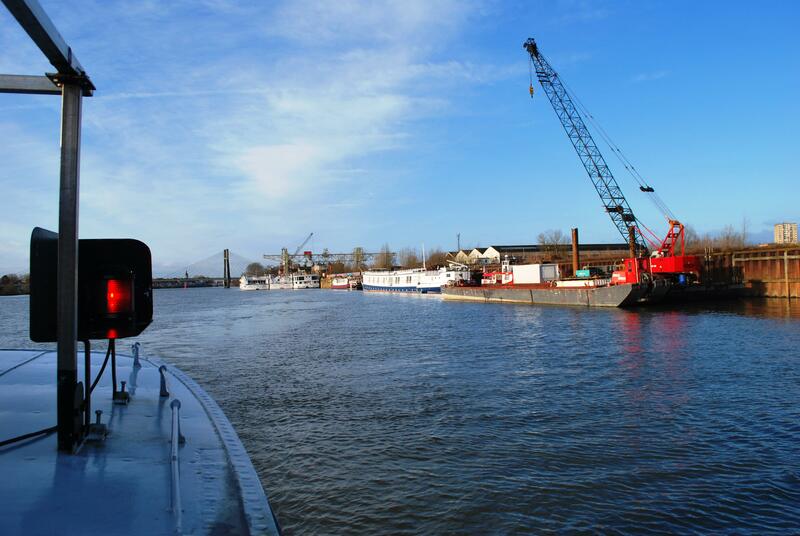 This entry was posted in C'est La Vie - The Boat, Chalon sur Saone, Experiences on the Canals, On the Journey, People We have Meet on the Gap Year, Places visited, Uncategorized, weather and tagged Chalon sur Saone, Saint Jean du Losne, saone river. Bookmark the permalink.